The Clean Energy Jobs Act far exceeded expectations this past legislative session. The bill was ultimately voted down in a House subcommittee for two reasons: 1) Lawmakers don’t like to pass bold legislation in election years and 2) Some lawmakers felt that we were asking for too much too soon after passing the 25% by 2020 legislation. But with your help, we will pass this legislation next year. The Clean Energy Jobs Act gained incredible traction with legislators this session. 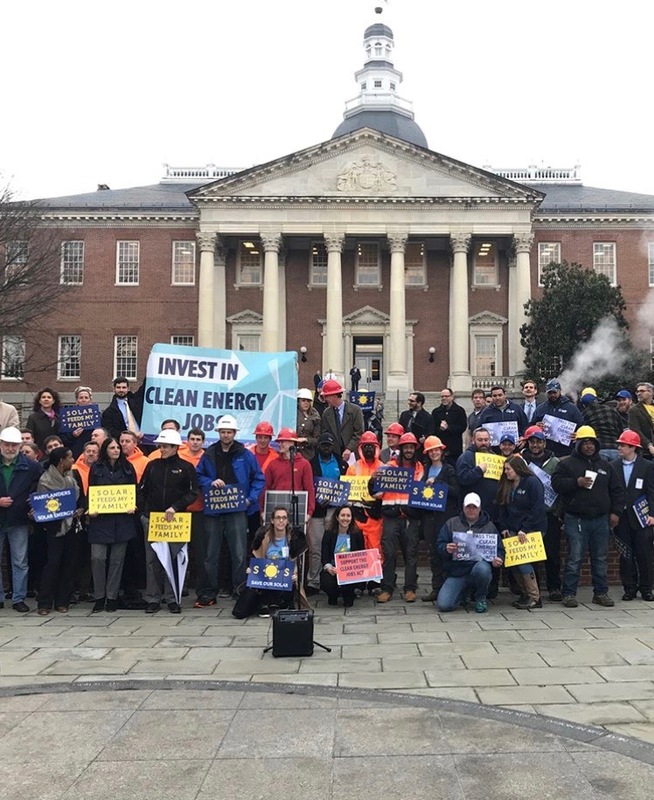 With 77 cosponsors in the House of Delegates and 24 cosponsors in the Senate, both a majority for each chamber, the Clean Energy Jobs Act garnered overwhelming support among lawmakers and was widely praised around the state. 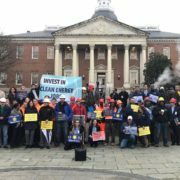 Check out our list of over 650 Clean Energy Jobs endorsers from groups across Maryland. Click here to see a list of our House Cosponsors and our Senate Cosponsors from this past session. Given the statewide enthusiasm and support behind the Clean Energy Jobs Act this past session, we are confident that the legislation will pass in 2019. Together, we will push lawmakers to do what is right and to do it now; we don’t have time to waste. The Clean Energy Jobs Campaign is following a proven six step model to pass this legislation. We are now entering phase five: candidate outreach and voter education. We have reached out to every single candidate for office in Maryland and asked them where they stand on this issue. They have until June 8th to respond. Following June 8th, we will publicize candidate responses and educate voters all summer on which candidates support the legislation – and which do not. You can help with this. Start reaching out to candidates in your district and across Maryland. Ask them to sign our Candidate Statement of Support and mail it in or sign online here. Getting as many candidates to endorse as possible is an important step toward a victory in 2019. We have a little over a month so lets hit the ground running. For more information on this phase of the campaign or for tips on how to reach out to candidates, call campaign manager Nikki Richards at 443-631-4038 or email nikkirichards1993@gmail.com. Together we will win in 2019! https://www.cleanenergyjobs.org/wp-content/uploads/2018/04/Annapolis-Session-Pic.jpg 915 748 Clean Energy Jobs https://www.cleanenergyjobs.org/wp-content/uploads/2017/01/MD-CEJI-SM-Logo-1.png Clean Energy Jobs2018-04-20 13:39:332018-04-26 13:49:222018 Legislative Session Recap: What Are Our Next Steps?